One of my favourite places to be, especially on a sunny day, is the prom in Salthill. So how lucky was I then, getting to visit the prom in Salthill not just once or twice but three times on Tara and Paddy’s wedding celebration at Galway Bay Hotel, each time in beautiful weather. I’m going to guess that the prom in Salthill is going to be one of the favourite places to be for Tara and Paddy from now on too – him from Cork, her from Tipperary. 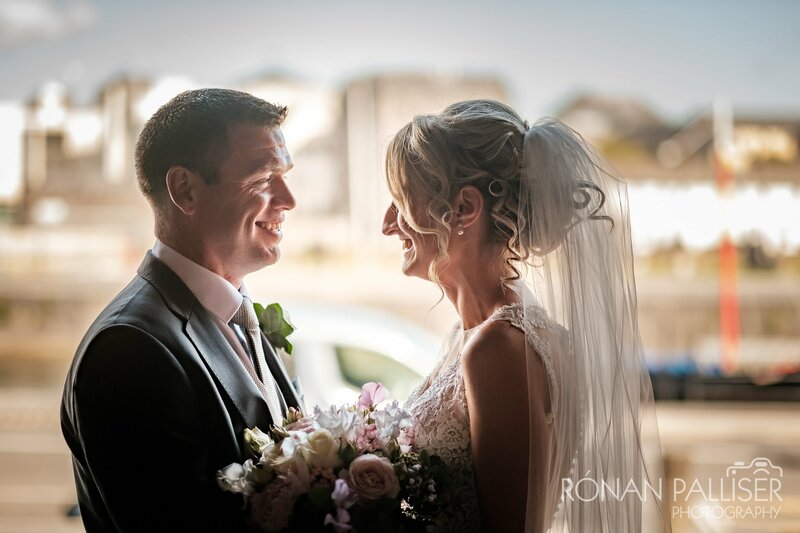 Having both travelled back to Ireland from New York for their wedding, the Galway Bay Hotel​ proved to be a fantastic choice for their wedding celebration, with the nearby St. Mary’s Church on the Claddagh hosting the ceremony. Both Tara and Paddy got ready (separately) at the hotel, allowing me to capture some photos of both the bride and groom prep in the morning. After a quick drink in the bar, Paddy headed off to the church as things got a bit more intense upstairs for the bride and bridesmaids. Paddy hails from a big family – including his brothers- and sisters-in-law and his nieces and nephews the family photo was in excess of 60 people, so I was glad of the balcony in the church for that after Fr. Whelan’s ceremony (conducted with the aid of a giant magnifying glass!). Tara was keen to make use of the weather and the locations so our route from the church to the hotel included three brief stops – the Claddagh with Long Walk in the background first, the lovely park next to the hotel in Salthill next – somewhere I hadn’t been since my third ever wedding back in 2010 – and then the prom (for my second visit of the day – my first being a short walk for some photos earlier that morning). All three locations worked well, even in unforgiving sun which had me seeking out shade whenever I could find it. Those stops meant that Tara and Paddy were able to relax with their guests upon arrival at the hotel and I got a chance to capture some of the details from the wedding as well as guests enjoying the afternoon. Speeches were before the meal and were very entertaining, while the surprise singing waiters during dessert were a big hit with the guests and really got the party started. Before the first dance there was time for my third and final trip to the prom that day to get some photos against the dusky sky – a great way to finish a great day in one of my favourite places!